Use your fingers to create this easy apple or cherry tree. The picture to the right is a photograph of the finished craft. Stamp the side of your hand in brown paint and stamp it on the paper as the trunk. 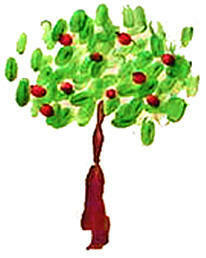 Good for Adam and Eve, Johnny Appleseed, Arbor Day, George Washington (cherry tree) and Summer themes.